Overview: This alarm clock is not only an alarm clock, but also cuckoo clock. Multiple ararms are compounded in a group, and you could set this group’s all alarm only one touch! This alarm clock is not only an alarm clock, but also cuckoo clock. Snooze is disabled when installed. If you set up ‘skip’ for the alarm, the alarm will not ring only next time. Its next alarm will ring as normal. 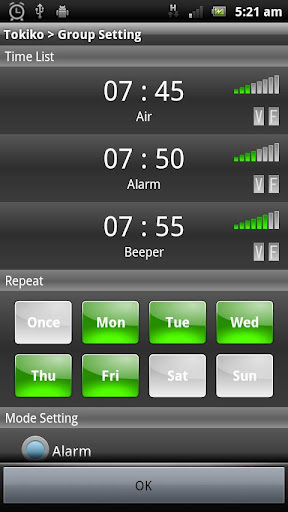 For example, it is useful when a plan has changed, alarms are no longer need that day. You could set the snooze time-out alarm time and for each group. You will also be available further alarm that is locked with a key code. In order to use this function, please enable the configuration. ADD TO IGNORE LIST IN TASK MANAGER.